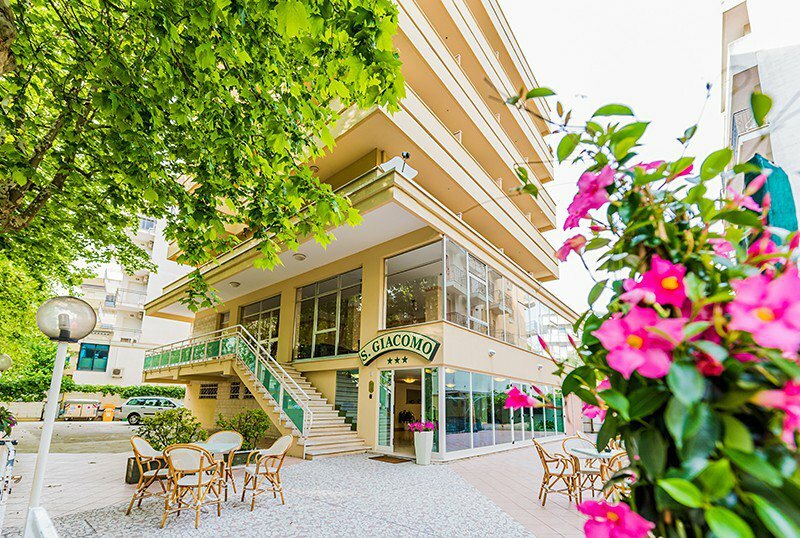 The 3-star Hotel San Giacomo in Cesenatico is the annex of the nearby Hotel Michelangelo. Guests can enjoy the services of both facilities. Among these: private parking, outdoor garden, bar, swimming pool and beach entertainment. Admits small pets upon request. The property is located in Valverde, a quiet hamlet of Cesenatico, a few steps from the beach and near the large park of Levante. In a short time you can also reach the historic center of Cesenatico. There are 3 types of rooms: those consisting of a single room, those with two rooms, and family rooms. All have a large balcony, air conditioning, satellite TV, safe, telephone and private bathroom with shower. FAMILIES : family solutions are available with two independent but connecting rooms. PETS: small pets are allowed on request. BREAKFAST: buffet with homemade cakes and biscuits, coffee, cappuccino and other sweet and savory dishes. LUNCH AND DINNER: restaurant with à la carte or buffet menu. CHANGES: the menu offers vegetarian variations and, on request, the kitchen prepares gluten-free dishes. In the hotel: children's pool, strollers (for a fee), baby / mini club, activities with board games, water games, tournaments and workshops. On request: bottle warmer, baby sitter and pediatrician. At meals: seats at the table, baby food, dedicated menus and afternoon snacks. 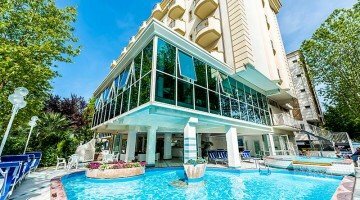 Hotel guests can enjoy the outdoor swimming pool located at the adjacent Hotel Michelangelo. The pool is supervised by a lifeguard, has heated water and hydromassage jets, shallow water area for children and a waterfall. On the pool deck there are sun loungers. TOURIST TAX: Excluded, € 1.50 per day up to a maximum of 7 consecutive nights (excluding children under 14). - Meals can not be deducted, but replaced with packet lunch. Children up to 2 years FREE, in room with 2 adults in full board and all inclusive, for a minimum stay of 7 days! Offer valid for a limited number of rooms! Pectoral package + Hotel with guaranteed participation. You just have to contact us!